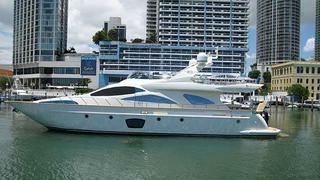 More news from Oceanstyle by Burgess as the Miami office signs the 24.4m motor yacht Allora for sale. An Azimut 80 built in 2007, she has an extensive list of custom upgrades setting her apart from other yachts in this class. A fine cherrywood interior accommodates eight guests in four staterooms and she's powered by twin 1570hp Caterpillar engines. Lying in Miami, Allora is asking $2,995,000.